Homeopathy teaches that symptoms are to be encouraged, by prescribing a "remedy" in minuscule doses that in large doses would produce the same symptoms seen in the patient. 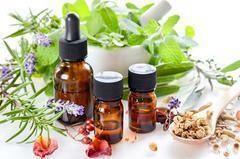 These remedies are meant to stimulate the immune system, helping to cure the illness. Our goal is to provide you with information and herbal remedy alternatives for common conditions and ailments that are natural, chemical-free and without the risk of side effects. You may have heard the term "standardized" extract used in relation to natural herbal remedies, but do you know what it means? Many pharmaceutical companies have begun manufacturing herbal remedies using an extraction process where harsh chemicals are used to extract the active ingredients of medicinal herbs. You can recognize these extracts by the usage of the words "standardized extract" on the labels. This method of manufacturing is often cited as being more scientific and able to produce a superior product with controlled and guaranteed amounts of active ingredients in each product. Contrary to these claims, this process is not approved by the manufacturers of holistic medicines. One reason, the extraction process and isolation of the so-called "active ingredients" from the herb has resulted in an increase in side effects, as the herb loses its natural ability to protect against side effects. In addition, many manufacturers use all parts of the plants to create "standardized" extracts, whereas herbalists understand that only certain parts of some herbs should be used. For example, it is well known that the seeds of the Ginkgo Biloba plant are poisonous and can cause seizures, and only the leaves should be used. "Standardized" extracts of Ginkgo Biloba have been associated with the risk of seizure in some trials. The most recent example of the dangers associated with using this manufacturing process includes the development of liver toxicity from using Kava Kava extract, an herb which has been safely used for hundreds of years! Another reason, this extraction process also requires the use of harsh chemicals and solvents, traces of which are difficult to completely remove from the final product. It makes little sense for companies to go the "natural" route, while unable to guarantee their products are free from contamination with chemicals known to be harmful to your health! Unlike the many so-called "all natural herbal remedies" manufactured according to the methods described above, we recommend the natural herbal remedies made by Native Remedies. A company that avoids "standardized" extracts completely and uses the Full Spectrum method of extraction, which is recommended by all the authoritative Materia Medica dealing with herbal medicine. This helps to maintain the integrity, balance and therapeutic effect of herbs, with the least risk of side effects or harm to your health! When you purchase Native Remedies all natural remedies for health, you can be confident that you're receiving a product that has been manufactured to the highest standards of health, production and effectiveness!